The official weigh-ins for “UFC 150: Henderson vs. Edgar II” take place today inside Pepsi Center in Denver, Colorado. Stream Friday’s weight contest live right here on 5thRound.com starting at 6PM ET/3PM PT. 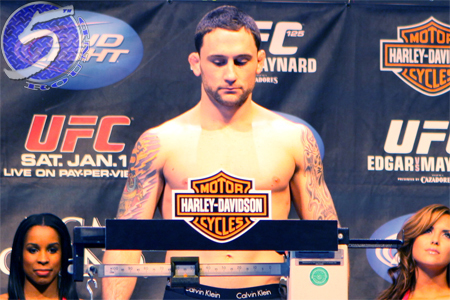 Former lightweight champion Frankie Edgar (Pictured) gets the chance to avenge his loss to current king Benson Henderson in Saturday’s featured attraction. A 155-pound affair between Donald Cerrone and Melvin Guillard serves as the card’s co-main event.